Hi! I love Twilight, James Dean, dark comedies, and wheat thins. Two kids, one husband, no pets. I would love to have a pet rock though. Mine ran away. My husband has a recipe on how to make a grilled cheese sandwich, but I don't need one. Emmett and Rosalie are a couple marked by their physical relationship. Were they always so comfortable with one another? Rosalie was marred by invisible scars. Emmett wanted her anyway. Judges pick in the All You Need Is Love Contest and fourth place in public voting. 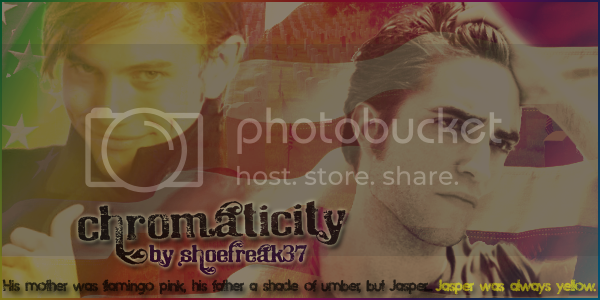 Chromaticity: the quality of a color as determined by its dominant wavelength and its purity. Edward finds that compartmentalizing his life in shades of color doesn't make it any easier to live. Slash/AH. 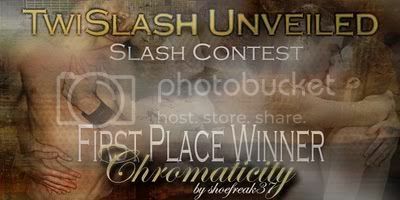 Winner of the Twislash Unveiled Anonymous Slash contest.